It is probably just that I had been playing for nine hours straight, or maybe even that I was getting a little delirious toward the end, but it finally occurred to me early this morning that the Arcana voice is actually in the protagonist’s head. He is imagining, during each interaction with other people and as the social links level-up, some grand voice telling him things. It’s an observation that struck as both quite creepy and equally rather hilarious. Imagine having a conversation with your friend, some deep dialogue about their hurts and dreams, and then some grand voice announces, only to you, that your social link has gained a level. It’s rather funny, right? Your friend has bared her soul to you! Gain one in the Chariot Arcana. You now have the ability to make new monsters! Maybe only to me, then? I mean, sure, the schizophrenia would be bad, I’ll agree to that, but I do so enjoy the idea of a bombastic announcer narrating banal life events. Dan loaded the stapler. Plus one to office supplies arcana! Since around two days ago or so, I think, I’ve been using a couple of different guides as references for the game. While the video isn’t posted yet, it is obvious in places I feel that I already know the answers questions before they come up and walk into fights with the correct Personas and techniques learned now. It’s not something, even when playing on “Beginner,” I am going to apologize for either. I am cramming in a huge of amount of game playing time within this week — I’m not going to be mocked for wanting to get the most out of it. To that end, I spent a longer time grinding my characters before taking on the dungeon I knew was coming up this session. I wanted to make sure I didn’t die as often as I had been doing in earlier dungeons. I was, as I noted the other day, quite annoyed at the Shadow Mitsuo boss battle and didn’t want that to happen again. The results of me plugging away at this game was that I began to try to guess at the exponential curve points for the characters. Knowing that all RPG leveling systems are based on an exponential curve, with each new experience level based on a formula of (1 + rate)^level, I tried in my head to guess the designed battle to level-up ratio. In other words, how many battles (roughly) should I expect per character level. I still don’t have hard calculated numbers, but my guess was about a dozen to 15 for one to two levels under, half that number for current level, and half that again for one to two levels above that. So, if you are fighting enemies at one to two levels above you, the characters should level-up every six to eight battles. Or, put another way, at least two enemy encounters per floor within the four-level structures of the dungeons per character level matching that of the enemies. Persona 4 likes to think, I imagine, that it is embracing the idea of having a queer character in Kanji and trans in Naoto but, in truth, it is actually pushing them down, kicking them, and then walking away. Kanji, even after embracing his “other side,” is referenced as a “pervert” constantly for having feelings toward Naoto up until the “reveal.” After that, because Naoto is now a “girl,” Kanji has been “redeemed” to the heteronormativity of the game — See? He likes “girls” too! It’s all okay now! 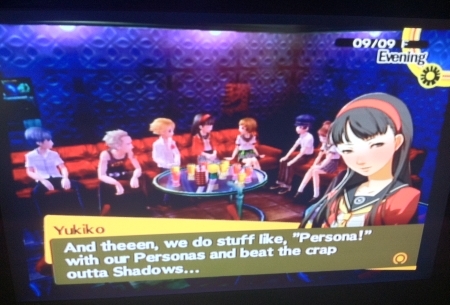 In fact, you see the change even in the in-game dialogue immediately for Naoto. Instead of seeing him referenced with male pronouns, the game itself switches. 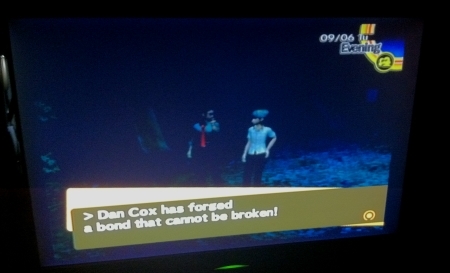 This is now the “truth” of Naoto, states the game very explicitly. 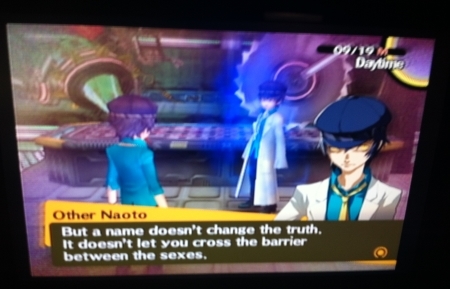 You, as the player, need to be reminded that Naoto is a “she” every time he comes up on conversation. 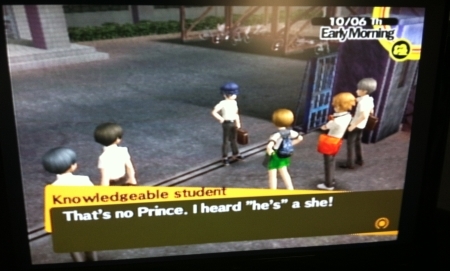 In case you forget: Naoto is a “she.” Remember that. It’s sad, too, that the game takes what is a very basic “I just want everyone to like me” premise for the characters and spins it out like this. All of these are “complexes” and not true feelings. Kanji, the game states, is just confused about his “masculinity” because he spent all of his time in a textile shop. It is only because he was not around “real men” that he has become like this. Both his aggression and femininity are a result of his upbringing. He’s just in a phase. The same with Naoto. He liked the police work of his family and grew up on different science fiction series. Wanting to “dress” the part, he donned “men’s” clothes and became a Junior Detective. It was other people, not him, who labeled his work and he just followed in the footsteps of his grandfather. In other words, without “proper” female guidance, he was confused about what he should “be” and has been that way for years now. After all, the police force prefers “men” to work cases and, as long as Naoto is passing, this is fine. Can’t have “girls” doing police work. That would be crazy, obviously. 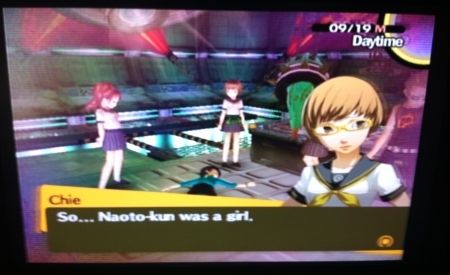 And even with all this other mess, what I found most damning was the “male” tone used by Naoto in the game. The word choices are masculine in nature, purposely playing up, the game wants to point out, the overcompensating nature of Naoto’s life. His logic comes from his masculine side. In order to think clearly, he must reject all touches of femininity and lose all connection to emotion. To solve cases, he must become a “real man” and become more robotic in tone and action. It’s an opinion reflected in the boss battle too, as half of Shadow Naoto is mechanical, reflecting this idea, while the other half is human. Yet, as I noticed, he attacks from the mechanical side, leads from it even. To reach out to others, to connect with them, he has to show his “male” side of himself. The world and his work demands this from him: conform or we will reject all of your work in the past, present, or future.